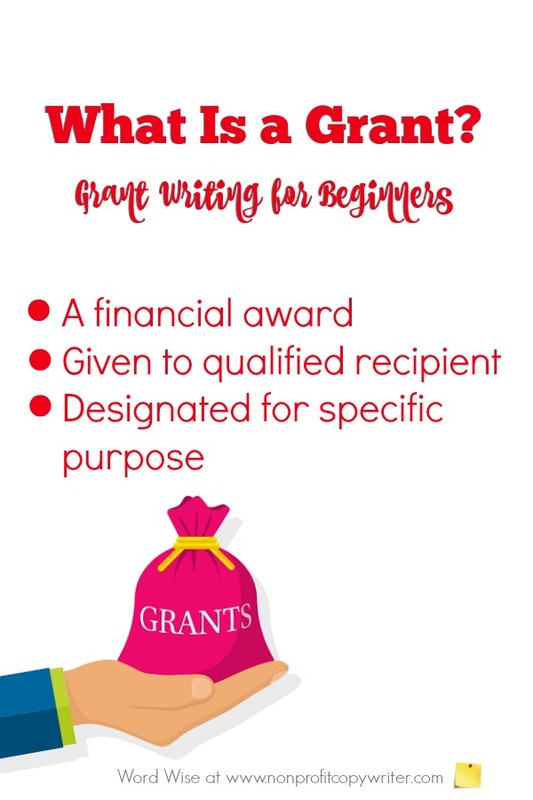 This quick orientation in grant writing for beginners provides a quick snapshot about the world of grants for you, your nonprofit, your faith-based organization, and other worthy causes. Mama said, “Nothing in life is free” – and she was right. Any person or organization who has received a grant will tell you that winning the award took some work. But you CAN have success and get funding for your cause - and find encouraging, engaged partners along the way - when you understand the basics. A grant is a financial award to an eligible recipient that is designated to be used for a specific purpose. It differs from a loan in that it does not have to be paid back. Grantors or grant makers – those who award grants to recipients – fall into three main categories: private foundations, corporations, and government. These are people and groups who want to invest in your great work. Generous folks they are! Private foundation grants are funded by an individual, family, or community. These grants most often target specific areas of interest of the funder. For instance, a businessman with close ties to Israel who has a ‘rags-to-riches” personal story may fund a foundation that offers grants to nonprofits, religious groups, and individuals who cultivate educational initiatives in Israel. Corporate grants are funded by for-profit businesses. These grant resources may be furnished by company profits, donations from employees, or may be directed through a separated foundation sponsored by the corporation. Why do businesses offer grants? Grants build goodwill in the communities where the funder operates. Corporate funders are savvy enough to offer grants that line up with the company’s products and services. A home improvement business, for example, understands the power of home ownership and may fund homelessness or urban home renovation initiatives. Government grants are funded by city, county, state, or federal budgets. They are designed to meet the needs of the community (local, state, or nation) and usually address that community’s social problems. Who qualifies to apply for grants? Religious organizations: faith-based groups, including churches, synagogues, and mosques, that operate programs that meet humanitarian needs. A small number of grants are available for faith-centered initiatives. Public/private organizations: groups that have ties to both public and private sectors, such as charter schools and city foundations. Grantors are clear as to whom may apply for the funds they offer. As you consider applying for a specific grant, be sure to read its “Qualified Applicants” section first to determine if you or your group qualifies. How do I find grants to apply for? Go to workshops and professional meetings related to your cause. Subscribe to notifications from grant clearinghouses such as The Foundation Center, Grants.gov, and state/county listings. Search listings at your public library. Request access to the library’s online data base grant search tools. Ask other nonprofits where they seek grants. Study their websites and literature to find out how they are funded. How do I determine if I qualify for a particular grant? Funding interests. Does the funder’s interests and funding record line up with the work you do? If no, don’t waste your time. Most funders list their areas of funding interests on their website and other application materials. Extra tip: review the list of past awards made by the funder, also listed on the website and on the funder’s Form 990 (which are made public – just do an internet search.) For example, if you are a literacy organization, don’t apply to a foundation that targets environmental action. Geography. Note the grantor’s geographic area served. Do you work in that location? Budget. Does the grantor consider applicants with a particular budget size? Ability to comply. Can you meet the grant award’s application and reporting requirements? Grant applications follow strict timelines. Make sure you don’t disqualify yourself by missing a deadline. Take note if you are to submit the application via email, through an online portal, or as a hard copy. Be ruthless about assembling all required attachments and submitting them according to the directions. Be certain you will be able to follow through with reporting on outcomes, if you are awarded the grant. Strategic Planning for Nonprofits: What's It All About?